I think I’m starting to get Montréal enough to get my anti-seccesionist resentment on again. Not by talking to the locals: I don’t much, and when I do, they are perfectly courteous and pleasant. Like the guy I just bought my replacement camera from. I did stampede the conversation into English, because I was buying a camera and not a shawarma, so I needed to know what was going on. And I didn’t think my attempts to inject some soupçons of apologetic French were that convincing. But after I said I was un touriste d’Australie, I did smile when the camera store guy asked “did you learn French here, or down there?” Zut, I should hope your French courses for foreigners aren’t as crap as my French would indicate. He was also surprised I had heard of Avril Lavigne. (She’s doing an ad campaign with Canon, and because of her red is the default colour camera they sell—I bought red anyway). Quebeckers (or at least Franco-Quebeckers) love Quebec cinema, and Quebec music: it’s their music and cinema, and it isn’t American. They loathe it (so my guidebook says) when the only Quebec music anyone outside Quebec notices is whatever’s in English (and Céline Dion). But Avril sings in la langue maudite; surely it’s not that surprising I’d heard of her? 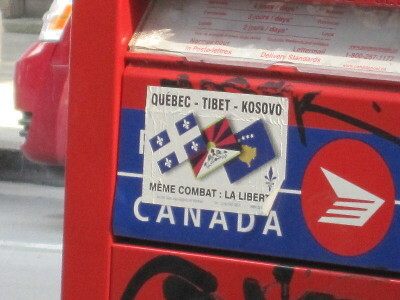 But my main source are the local blogs I’m dipping into; and my “Screw Secessionism” reaction came to me when I read a French blog post grousing about the temerity of Ottawa, festooning Red Maple Leaf flags around Old Montreal during the 400-year anniversary of the founding of the city. Dude, you ain’t seceded yet. You’re still in Canada. And 1608 matters in the history of Canada, not just the not-yet Republic of Quebec. It’s not as if there would have been a shortage of Blue Fleur-de-Lis flags in Place d’Armes. For bonus points, the rejoicing that les Quebecquois stopped calling themselves Franco-Canadians after the Quiet Revolution. (The post responded to, I found a lot subtler and less knee-jerk, and I commend it to you.) I get the impression the Francos of Ontario don’t figure prominently in the secessionist imagination. Like, say, Avril Lavigne. What I find interesting though is that blogs are a way of breaking down the Solitudes. There’s still plenty of resentment to go around. But at least Dans le Palais d’Enkidu is commenting at No Dogs Or Anglophones. He doesn’t agree with a lot of what No Dogs says—in fact, he draws attention to it on the few occasions he does. But he doesn’t have to agree: at least they’re talking. Andy Riga’s “Franco comme moi” experiment, to confirm whether you couldn’t get any service in French on the West side of town as the Franco press claimed, was condemned by some readers as sensationalist. I think it was intriguing, and something that presupposes a breakdown of the Solitudes. After all, the guy’s kids do go to French school by choice, not compulsion: he’s writing for the Anglo paper, but he’s committing to the city’s Franco future. And mea culpa, AFG: I did not assume there were actual Language Police guys with truncheons and measuring tapes (though as you admit, it’s a compelling image), and I’m happy to hear that less than 5% of all complaints to the Language Police appropriate provincial body result in followup. On the other hand, finding out that no shop could display anything but French at all until 2003 is something I find unforgivable enough to stick with the disparaging term. But thank you for the context anyway. It will be even better if a Mec Anglo Colère is doing the reverse on French linguistic turf, or No Dogs is yelling in some secessionist blog’s comment section en français. For all I know, that is happening. It should: Bridging the Solitudes, Briser les Solitudes should be happening at both solitudes. And even if Quebec does become independent, the Solitudes will be bridged. You’ll still be stuck next to each other, you will still end up talking. Which is for the good.